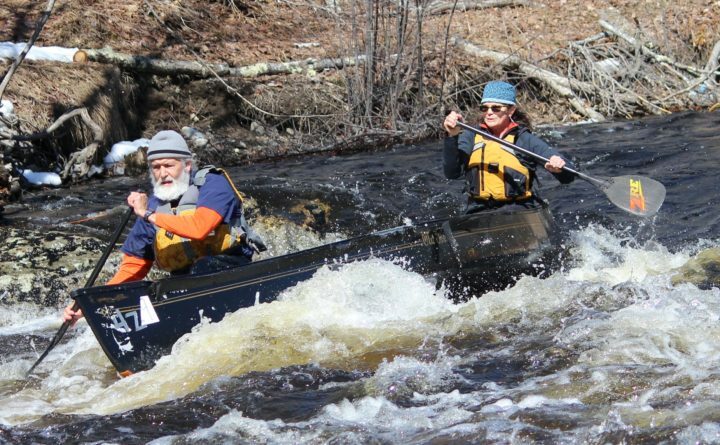 SEARSMONT, Maine — As the first day of the competitive paddling season arrived on Saturday, bright and sunny, some of the area’s top paddlers spent the morning reacquainting themselves with the rapids during the 39th St. George River Race. And some got up close and personal with more stationary objects, as well. That didn’t happen, but the tree did claim her paddle, forcing a short mid-race change in tactics. “I said, ‘Can we wait for my paddle [to float by]?’ Thebaud said with a chuckle. “It was a $300 paddle that I bought for her,” Loring joked. The Thebaud-Loring team was one of 109 that entered the race, which was staged under sunny skies, with air temperatures near 50 degrees. The water, of course, was much colder. And it was higher than originally expected. As is often the case, kayakers posted the fastest overall times, with Ben Randall taking the top spot in 39 minutes, 10 seconds. Ray Wirth was second in 40:31 while Hank Thornton was third in 40:49. Rod McLain paddled his one-man canoe to fourth in 41:54, while Jeff Owen and his 14-year-old son, Tommy Owen, were fifth overall in 42:07. 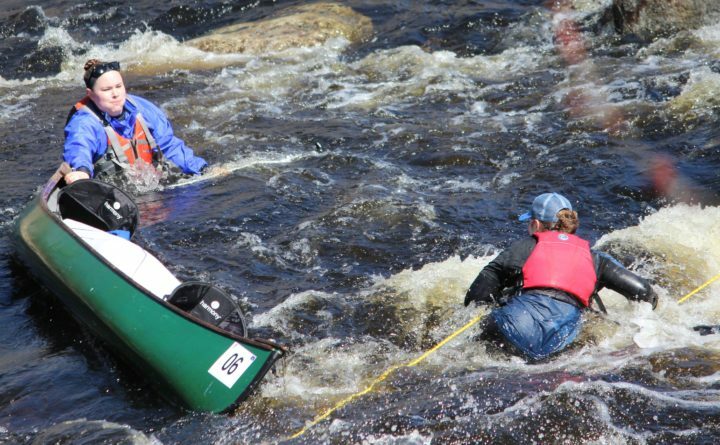 The St. George was the first race on the Maine Canoe and Kayak Racing Organization’s whitewater schedule. The next race on the circuit will take place on the Passagassawakeag River on Saturday, April 7. Dale Cross, the longtime race director, said earlier in the week that he was hoping for steady melting and a Thursday rainstorm to help the river level rise from the downright rocky — “bony,” in the vernacular of paddlers — state it was in. Evidence of that: A surprising number of paddlers capsized, and some didn’t end up finishing the race. That, according to Cross, is just one of the alluring aspects of the sport. All around the river, avid canoeists and kayakers gathered, greeted each other, and celebrated another opening day. Jeff Owen of Orono said he looks forward to paddling season all winter. Tommy Owen, who has been racing with his dad for the past five or six years, continuing an Owen family tradition — Jeff did the same with his dad growing up — said he had an enjoyable morning on the water. “It was fun. I didn’t get wet,” Tommy Owen said. The Owen team wasn’t the only adult/teen combo competing on Saturday. In fact, three accomplished adults — Owen, J.R. Mabee of Bangor, and Clayton Cole of Corinth — were teamed up with teens for the race, and each fared well. J.R. Mabee competed with his 16-year-old son, Nolan Mabee, (eighth overall in 43:56) while pal Cole shared a canoe with Mabee’s 14-year-old son, Ashton Mabee (11th in 44:45). Cole said the St. George is a perfect place to introduce people to whitewater paddling. “These first two races [on the St. George and the Passagassawakeag] … are very well suited for new paddlers,” Cole said. Then he nodded toward his 14-year-old partner. That’s true of all three: Ashton Mabee, Nolan Mabee and Tommy Owen each have fared well in national competitions staged on the Penobscot River the last three summers, as well as in local races. Ashton Mabee hoped for a top finish, but said he’d enjoyed the race no matter what place he and Cole finished. His dad, J.R. Mabee, agreed with the sentiment.